You can change the way layers are displayed in Storyboard Pro via the Global UI tab of the Preferences dialog box. • Current Layer Text Colour: Changes the colour of the layer text when the layer is active. • Selected Layer Text Colour: Changes the colour of the layer text when the layer is selected, but not active. • Default Layer Text Colour: Changes the default colour of the layer text. • Current Layer Colour: Changes the colour of the active layer. 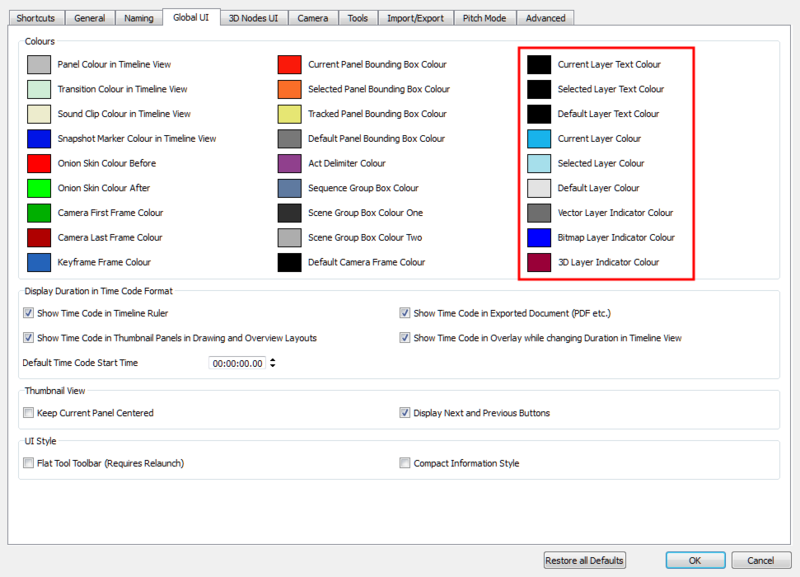 • Selected Layer Colour: Changes the colour of selected layers which are not active. • Default Layer Colour: Changes the default colour of a layer. • Vector Layer Indicator Colour: Changes the default colour of a vector layer. • Bitmap Layer Indicator Colour: Changes the default colour of a bitmap layer. • 3D Layer Indicator Colour: Changes the default colour of a 3D layer.